Whether they get a room of their own or a small space in your bedroom, it should be beautiful. Soothing, yet playful. It should stimulate their senses and their endless curiosity, but not overstimulate. Most importantly, it should be THEIRS – their place to hide and feel safe, their place to dream and cuddle, their place to giggle and play. Chances are you have a vision of how you would like your child’s space to look or you fell in love with a piece of art/furniture/accessory which inspired you — you just have no idea where to begin. Bamboola Baby can help you by creating an electronic design board tailored to your vision, lifestyle and budget. It will display design inspiration, from furniture to accessories (such as rugs, curtains, pillows and art) to wall paint. I pride myself on finding unique pieces, handmade and eco-friendly whenever possible, and always in your budget. 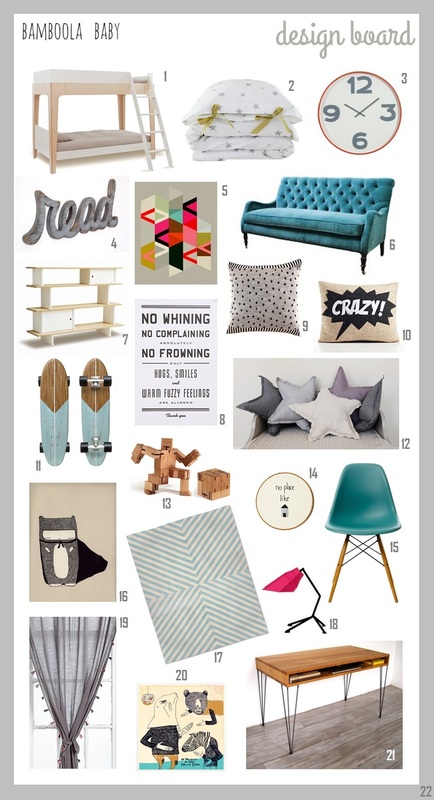 You will also receive a list of product links so you know where to find all of the items from the design board. Sample design boards are displayed below. To get started, email me and we will go from there. Both packages are digital and we can communicate via email, so it doesn’t matter whether you live near or far. Mod Boys’ Bedroom, ages 5 and 9. Polka-dot Unisex Twin Nursery (on a tight budget). Whimsical Woodland Baby Girl’s Nursery. Design Solution: Nola’s getting a very cool metal bed in black, topped with black & white stripy bedding and a pile of handmade pillows. The bed sits in the left corner of the room and both of the walls the bed touches are going to be white with black polka-dots. Next to the bed is a green night stand with a black lamp. Next to the night stand (and under the window) is a low bookcase in white. The window curtains consist of two thick, room-darkening panels in peach. On the right side of the window (in another corner of the room) is a black floor lamp, beaming over a large black pouf – a cozy place for Nola to read. Next to the pouf is a beautiful white dresser, and then comes a small children-sized white table with a black chair where Nola can draw, write and create. The wall above the pouf/dresser/table is white and features unique handmade art and fun metal letters spelling Nola’s name. 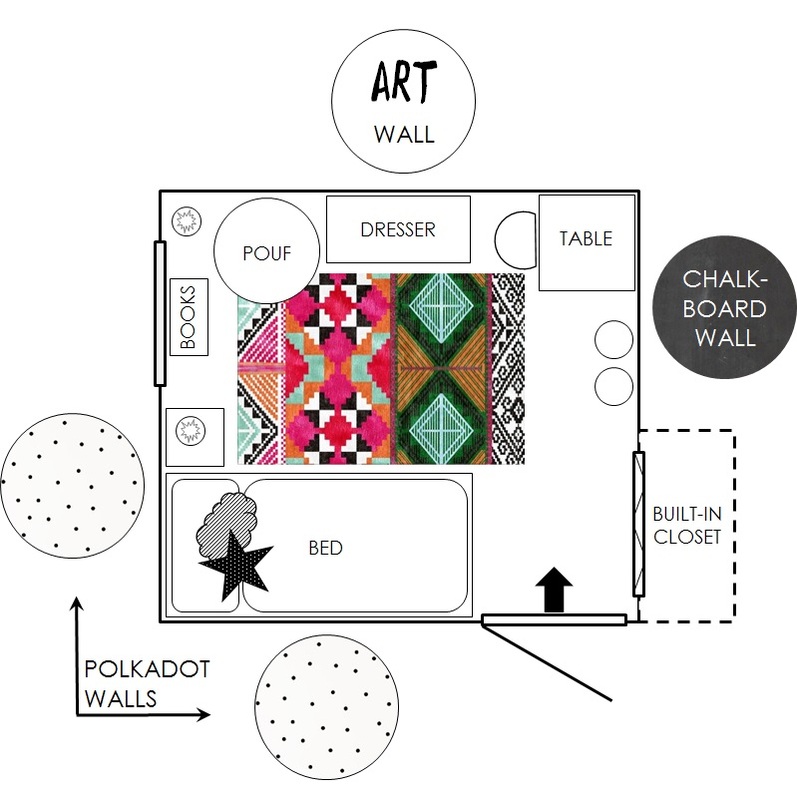 The small table is in a corner of the room – where the white art wall meets a black chalkboard wall – an additional space for Nola to draw, write and express herself. There’s just enough space on the bottom of this wall (between the small table and a built-in closet) for a couple of cloth baskets to hold Nola’s toys. A large colorful rug in the center of the room makes a statement while keeping those dancing toes warm. More design boards coming up soon.